Bangkok is a large hub of Thai culture, so why not get out into the countryside and see where all of that amazing culture comes from? So many different options are available from markets to historical ruins, and natural scenery to cultural villages. Every person can find something that matches their interest, and it's all not far from Bangkok. Also, many of the destinations can be combined into a single tour. Or if you want to spend more than one day in a location, that can be arranged as well. It's really up to you, so check out all of your options and then book your amazing Thailand adventure. The floating markets of Damnoen Saduak are one of the absolute must-do activities near Bangkok. Here, hundreds of small boats move around the canals selling and trading their fruits and vegetables and other wares to each other. And you can experience it all right up close! In addition to the floating markets, this trip also includes a trip to the fascinating railway market of Mae Klong, as well as a nearby ancient temple supported by tree roots, and an evening boat ride with fireflies. This amazing 13-hour day tour is highly recommended! After a morning pickup from your downtown hotel in Bangkok, you will be taken in a comfortable vehicle to the floating market of Damnoen Saduak. Here you will browse through the market vendors before boarding your own long-tail boat to get up and close with the local merchants while the guide provides you with an overview and historical information. Opportunities to purchase food and souveniers will be plentiful! Next, you can eat on your own at the market (lunch is not included), and then head to Bang Kung Temple. This 18th-century structure is in partial ruins and is supported by the many banyan tree roots that have grown out of the earth around the stone walls. The photo opportunities are endless. In the afternoon, you will head to the Mae Klong Railway Market. This market takes place on the railroad tracks, and every time a train comes by, the market stalls must lower their umbrellas and move off of the tracks. It's a fun cultural and interesting sight to behold each time a train comes by. The final stop on the tour is another floating market, Amphawa. Here you can wander around, eat more food, and take in the sights. The final activity here is a boat ride where you will be surrounded by fireflies! About 2 hours from Bangkok, near the city of Pattaya, is this beautiful elephant sanctuary. On this trip, you will spend half of a day with the elephants. You will help to feed the elephants, take them to a "mud spa", and explore their habitat. All of the elephants are free to roam around the large expanse of land that this sanctuary owns, and part of the land contains a river. Yes, you guessed it, after the mud bath, you will walk with the elephants to the river for a bath. Where else will you have the chance to bathe with an elephant? Lunch is included at the sanctuary, as is water and transportation in a comfortable air-conditioned vehicle. This tour, and the elephant sanctuary itself, has been certified and approved by a number of tourism companies as a safe and caring environment for the elephants. 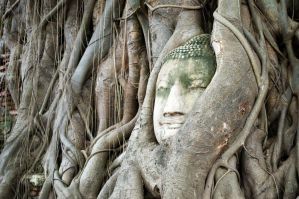 The ancient temples at Ayutthaya are a must-see for any visitor to Thailand. This day-long tour with a private driver will take you to the 14th-century ruins of the capital of the kingdom of Siam, where you will visit temples, the summer palace, and other amazing sights of the complex and other nearby areas. You'll have a chance to explore and take plenty of photos. Lunch is on your own, so you can keep the price as affordable as you need. This 8-hour tour from Bangkok combines the best aspects of a trip to the temples of Ayutthaya with a visit to one of the famous nearby floating markets. This 8-hour trip will take you to various temples as well as a floating market in a comfortable vehicle with a tour guide. To keep costs low, lunch is not provided, but all entrance fees are covered by the price of the tour. If you're looking for a more efficient trip due to lack of time in the area, this is a great choice! This terrific day trip combines an adventure to the must-see floating markets of Damnoen Saduak (see details above) with a fun and delicious cooking class. A guide will pick you up in a comfortable car from your Bangkok hotel. In the morning, you will experience the floating markets and all that they have to offer. First on foot and then in a long-tail boat. In the afternoon, you will head to nearby Tha Ka Cooking School where you will learn to cook no less than 5 traditional Thai dishes. And naturally, you'll be eating them, too! The last stop on the tour is Bang Kung temple (also described above). This 18th-century temple is now partially supported by tree roots and provides plenty of photo opportunities. This is all around a great option for those that might not have much time in the region and want to take it all in as efficiently as possible. If you're an avid bicyclist, this is definitely the trip for you! This trip is also recommended for those that do not have much experience on a bike, too. This 4-hour bike ride includes a stop at a local floating market on the weekends, as well as an old temple. Plenty of jungle scenery is to be found as you ride through jungle canopies, along canals, by local villages and schools, and around farms and orchards. The ride actually starts in Bangkok, and after a ferry ride across the river, your adventure will begin! The ride is almost entirely flat due to the topography of the region, so anyone who can ride a bike can participate. A guide is provided, as are water and snacks. Khao Yai National Park is a UNESCO World Heritage site full of stunningly beautiful landscapes and wildlife. On this day-long trip from Bangkok, you will be driven in a comfortable vehicle with a tour guide from your hotel and whisked up to the park. A park ranger guide is included while at the park, as are rain jackets, lunch, and all entrance fees. The first item on the agenda is to hike through a section of the park where you can observe local species and take in the scenery. Plenty of photo opportunities will be available! Next, you will have a traditional Thai lunch. Previous visitors have said the food is terrific! After lunch, you will tour the many exhibits at the visitors center for a little while, where you can learn more about the park's diverse species of animals and vegetation. Finally, you'll head to Haew Suwat Waterfall. This scenic spot was made famous by The Beach, the film starring Leonardo DiCaprio. Pattaya is a beach town not far from Bangkok. If you're short on time and don't want to miss a beach experience in Thailand, then this day trip is for you. A private air-conditioned vehicle will pick you up at your hotel and take you 2.5 hours to Pattaya. 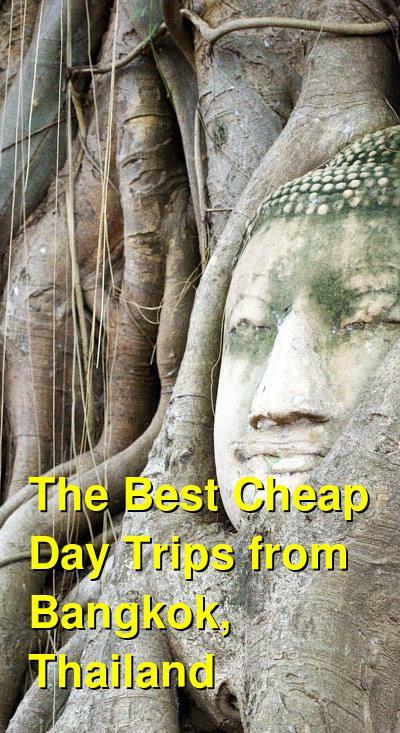 First, you will visit Khao Chi Chan, the large sculpted Buddha on the side of a cliff. Then, you will visit the viewpoint at Khao Phra Tam Nak. From here you can take in the surrounding area and get a great view of the city and the bay. Finally, you will spend a few hours enjoying the beach. Nearby are plenty of restaurants, bars, and shops for you to browse through, too. Lunch is on your own, so you can decide how much to spend. The trip then departs at 3 pm to return you to Bangkok by 6 pm. Dream World is an amusement park in Bangkok that features roller coasters, water rides, and other fun activities. This tour includes a skip-the-line entrance ticket, transportation from your downtown hotel or nearby meeting point, and an optional ticket for a buffet lunch and entrance to the Snow Town attraction.